Photo: Charles Kent House (also known as the Palmer House), ca. 1843, 125 North Pearl Street, Kent, OH. 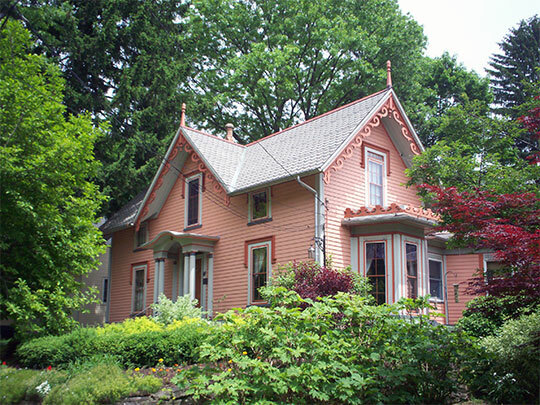 The house was moved from West Main Street in 1909. Listed on the National Register of Historic Places in 1978. Photographed by user:JonRidinger (own work), 2009, [cc-by-3.0 (creativecommons.org/licenses/by/3.0)], via Wikimedia Commons, accessed August, 2013. Portage County administrative offices are located at 449 South Meridian Street, Ravenna, OH 44266; phone: 330-297-3644. Portage County was established in 1807 from Trumbull County. The first elected county commissioners were Abel Sabin, Joel Gaylord and Lewis Day. The county is named for an old Indian Portage Path between the Cuyahoga and Tuscawarus Rivers.